Known for their sweet flavor and color, oranges are one of the most popular fruits in the world, according to "Fruits of Warm Climates." Tangerines are a part of the orange subclass of mandarins and identified by their thinner, red-orange skin. Both oranges and tangerines are low in fat and provide vitamins and minerals. 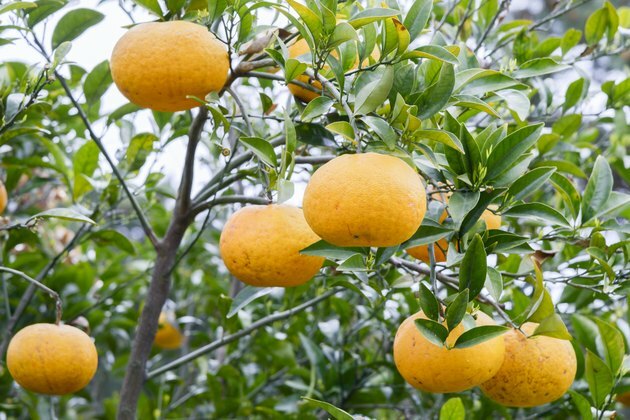 Oranges and tangerines are a low-calorie option used in salads, desserts, juices or eaten raw. According to the USDA National Nutrient Database, one orange that is 2-5/8 inches in diameter contains 62 calories. One medium tangerine 2-1/2 inches in diameter has 47 calories. Nearly all of the calories in both the tangerine and the orange come from carbohydrates. These include starches and sugars, which provide energy for the body, and dietary fiber. An orange has 15 g of carbohydrates with 1 g of protein and less than 1 gram of fat. It also has 3 g of fiber and 12 g of sugar. A tangerine has almost 12 g of carbohydrates with less than 1 g of both protein and fat. It also contains 9 g of sugar and almost 2 g of fiber. Oranges and tangerines are a good source of vitamin C, folate and the antioxidant beta-carotene, which the body converts to vitamin A. An orange provides 70 mg of vitamin C, 39 mcg of folate, and 93 mcg of beta carotene. Tangerines contain 23.5 mg of vitamin C, 14 mcg of folate and 136 mcg of beta-carotene. According to the Institutes of Medicine, adult men need 90 g of Vitamin C per day while women need 75 g. Recommended daily allowances for folate are 400 mcg per day for adults. There are no recommended daily allowances for beta-carotene. An orange provides 52 g of calcium, 13 g of magnesium, 18 g of phosphorus and 237 g of potassium. They also contain 33 g of calcium, 11 g of magnesium, 18 g of phosphorus and 146 g of potassium. The recommended daily allowance for calcium is 1,000 mg per day for adults. Adult women need 320 mg of magnesium while adult men need 420 mg per day. Adult men and women require 700 mg of phosphorus and 4,700 mg of potassium per day. Tangerines have 2 mg sodium, whereas oranges have none. This amount of sodium is negligible, since the daily recommended value is less than 2,300 mg per day for adults.